If your parent still lives in your childhood home, you will not only have years of memories, but also volumes of items to sort through. This can be a big job, so schedule time on weekends and in the evenings for family and friends to help organize, run to the dump, list items for sale online, box moving items, and make trips to charity drop-offs. The more hands to help, the quicker this process can go. If the job is too big, consider hiring help as an option. An objective third party can be helpful when making tough choices. Perhaps the best way to start is to determine what items will fit into the new home. Measure your new space and measure your furniture to create a new floor plan. Remember to not overstuff a new home with furniture. Wide paths are safer for walkers and wheelchairs. If you have ever watched a home decorating show, you may have seen this tried and true way to organize and declutter. Set up four boxes and label these: Keep, Trash, Give-Away, and Sell. As you pick up an item, place them in the appropriate box. Try to only pick up an item one time and make a decision. This system will help you quickly organize and move forward. Include your loved one as you sort through items, don’t lose sight that your parent is making a huge change in their life. They may be sad, upset, nervous, and feeling a sense of loss. Even if they agree that the move is the best choice, this can still be difficult. Be extra patient and understanding as you sort through their fond memories and personal items. It is surprising what may look like nothing to you, could have great meaning for them. Give yourself and your loved one plenty of time to go through everything without exhausting or frustrating them in the process. There are items, such as linens and towels, that you will one more than one set. But does anyone need 15 vases? Streamline the items in the home and only keep their very favorites. If there are duplicates, these can be sold or given to a family member who is starting their first home. Think about their new lifestyle. Will they still be hosting the family dinners? Will they be cooking? Do they have a space of a second TV? Most assisted living communities have private dining rooms that families can use. Their caregiver may have a stocked kitchen. The new smaller house may not fit the dining room table. Think about what they really are going to need on a daily basis and keep it simple as far as furnishings and décor. Keep plenty of snacks and water on hand to ease tensions during the declutter process. When family members and your loved one get hungry or thirsty, they may get cranky. Set up an area with quick snacks, coffee, water bottles, cookies and more to keep the troops happy while they work. If possible, try to tackle one room at a time to keep your loved one focused. Having a room completed can show real progress in their plan to downsize. Many adult children store boxes and personal items at their parent’s house. Adult children are responsible for their personal belongings and these should be removed immediately. If your parent is having a tough time getting rid of an item, we suggest that you take a photograph. A wonderful house warming gift would be to take photos of their old house and special items. Present these photos in a scrapbook that they can look at whenever they want to be reminded. This is a fresh new start for your loved one. When you have selected the items for the new home, are they in good repair? Does a couch need to be professionally cleaned? Does a dresser need a coat of new paint? Throw pillows, cozy bedding, photos in frames, favorite artwork, new towels, fresh plants, and knickknacks organized on shelves can make their new home personal, warm, and inviting. The best way to ease a transition is to decorate the new home in a way that is familiar and comforting. 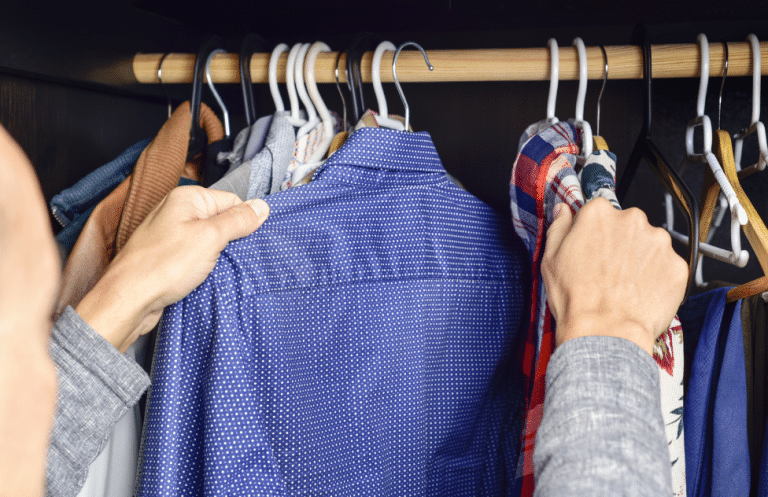 Roll up your sleeves and start to declutter with your loved one by your side. If you use patience, kindness, and humor, the move can happen smoothly.